Gaurav Kapoor’s act is always packed with relatable yet bizarre tidbits which are sure to leave you cracking with laughter. His puns are puntastic and his topics are fresh off the shelf. Gaurav Kapoor’s Rich People, Lifebuoy & His Nano, is the latest one from the pro of relatable comedy. Herein, he talks about how he hates rich people for they received everything which he couldn’t. He makes a direct comparison with his life and his car, which isn’t just any car, his car is an emotion! Gaurav is especially jealous of his one rich friend who was gifted a Skoda Laura by his father after bumping his Honda City. Gaurav also jokes about how Lifebuoy soap has created a certain image for itself. No matter how much the advertisements talk about this soap doing ‘Tandrusti ki Raksha’, but it will always remain the ‘handwash soap’. 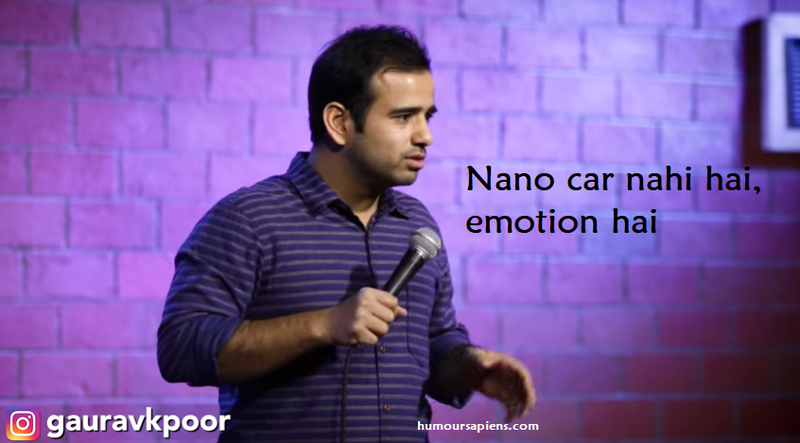 In this recent act of his, he takes his audience on a fun ride in his nano – the emotional car, riding in which on a highway is no less than an adventure sport. Watching this video will also give you a fair idea, why Alto is ‘the car of the year’.